What Does a Ginger Plant Look Like? What Are the Different Types of Ginger? The ginger you buy from the shops is actually the rhizome of the ginger plant. A Rhizome is the stem of that plant, but instead of growing vertically upwards, it grows sideways. The rhizome of the plant will grow mainly underground, but quite close to the surface of the soil. The roots of the ginger plant grow from the rhizome, as well as shoots which grow above ground which in some species of ginger produce beautiful tropical flowers. Other plants that grow in a similar way to ginger are turmeric, lotus and bamboo. The ginger family of plants is huge – there are roughly 1600 known ginger species in the world. Spices such as turmeric and cardamom are also considered part of the ginger family, as is galangal, also known as blue or Thai ginger. This type of ginger is very popular for flavoring Thai curries and Indonesian Rendang dishes. The most common type of edible ginger though is called garden ginger which is part of the genus zingiber. Ginger is a plant that loves humidity, so it tends to thrive in a more tropical environment. Keeping your ginger plant in an area with very dry air may also attract pests such as spider mites. The best spot for a ginger plant is warm, humid and with filtered or indirect sunlight – the ideal temperature for planting ginger is about 77 degrees Fahrenheit. You also want to want to ensure that your ginger plant is not overly exposed to strong winds. Ginger develops mostly below ground, and requires adequate soil coverage to grow properly. Too much exposure to wind and rain will cause soil erosion, exposing your ginger roots to the elements. The soil you are using has a big effect on the how well your ginger grows – as the ginger plant needs very nutritious soil. According to the University of Hawaii, the soil you choose should be mildly acidic, which is typical for tropical plants. Soil with a pH level of 5.5 – 6.5 is optimal for growing ginger. The soil you choose should also be moist, but well-drained, as too much water can cause your ginger plant to rot. The best way to create this balance is to add a sandy or loam mixture to your soil. A good soil mixture can consist of one part sand with one part compost. The sand assists with keeping your soil dry, whilst the compost feeds the soil, breeding good nutrients for your plant. The soil should also be well sanitized, and free of any pests, parasites or fungal pathogens which may bring disease to the root. Ginger is usually planted in early spring, to take full advantage of the spring and summer heat. A crop of ginger can take roughly 6-10 months to develop, making harvest time around mid/end Fall. Growing ginger from a ginger root is relatively simple, but it is crucial to the success of your final harvest. You need to make sure you select the best root and prepare it correctly. You can purchase ginger roots which are designed for growing, or you can simply use a root from the supermarket. You can pick the best roots for growing ginger by looking at their “fingers” which are little points at the cut off ends and edges of a ginger root. These are where the green shoots will sprout from to grow leaves and more ginger roots. Your chosen roots should be firm and succulent, and if those little green shoots have already started to appear you will also be at an advantage. There are two areas of thought when it comes to preparing your ginger for planting. Growing ginger requires the root to be undergoing some special treatment before planting into its final spot in the garden (or container). The first step is to soak your ginger root in warm water overnight, especially if you have purchased it from the grocery store. This is to remove any pesticides or growth chemicals that your ginger may have come in contact with. The second step is to give your ginger a kick start by growing it in a healthy, nutrient rich growing medium first before transplanting it into your garden. Steve over at the Rainforest Garden has a helpful tutorial on growing ginger roots by starting them in containers filled with sphagnum moss. You can use this moss to make your ginger plant stronger by growing fleshy roots to help it absorb nutrients before transplanting it into your garden or pot. On the other hand, if you have the perfect nutritious soil already setup, well-composted and with just the right amount of moisture, you may be able to plant your ginger root directly into the soil. If you are planting a ginger rhizome, you can either plant the whole thing, or you can cut or break it up into sections to grow multiple plants. Each rhizome should be planted 5-10 cm deep into the soil, and about 30 cm apart (remember ginger grows sideways!). If there are buds or leaves already growing on the rhizome, these should be facing up towards the sky. If you are planting in the garden, putting a nice layer of mulch on top will help feed your plant with more nutrients. It’s not a bad idea to stagger your planting times so that you will always have some ginger growing on the go, rather than having to wait for another 6-10 months for your next harvest. As mentioned above, ginger does need a humid environment for health growth, but the soil does not need to be saturated. A generous watering once or twice a week may be enough for your plants, and you should determine this by regularly checking how moist the soil is. You will need to mist the leaves and stem of the plant every 1- 2 days to maintain humidity. Do I Need to Fertilize Ginger? Whilst it’s not critical if you have good nutritious soil to begin with, growing good ginger can benefit from regular fertilizing. Using fertilizers such as chicken manure also have the double benefit of slowing and killing off root knot nematodes. If you have used a decent mulch on top of the soil, then fertilizing may not be as important as your ginger will be getting its nutrients from the mulch. A good mulch mixture for ginger can be made from a mixture of horse manure and worm castings (worm poo). Another option is to use an organic liquid fertilizer. Ginger roots start growing at around 2 months from planting, and will mature at around 6-10 months. Your ginger will be ready to harvest after flowering, when the leaves have dried out and are starting to fall off. It is possible to harvest small parts of the ginger at a time, by carefully digging up the ends of the ginger root and cutting off a small part of the rhizome to use, and then re-planting the rest. You may find that bits of ginger rhizomes will grow up through the surface of the soil, which can be broken or cut off and harvested before the rest of the plant. If you are ready to harvest the whole plant, gently dig it up with a gardening fork and check that the roots are well-developed. The plant itself must also be well-defined before harvesting. It can be tempting to harvest early, but patience is very important. Fusarium, which is a disease contracted from soil, causes rot and wilting. Because the best part of the ginger plant is the rhizome and roots, fusarium can have a disastrous effect on your plants. You can prevent this by ensuring you select a well sterilized soil which is free from fungal pathogens and parasites. Root knot nematodes are another nasty pest which likes to feed on your ginger. They can be tricky to get rid of completely, but can be controlled so that their damage on your ginger plants is limited. The presence of these little worms can be found on your ginger rhizomes – discoloration, warty lumps and unnatural grooves may be signs of an infestation. They tend to be more common in big outdoor crops, but they are soil borne, so if you are bringing outdoor soil indoors you may be at risk. If you are planning to do a lot of planting in the one area, using mostly the same soil, you may consider crop rotation. Crop rotation is where you plant one harvest, and the next harvest is a plant which is far less susceptible to the effects of the Nematodes, or even contains substances which kill them. The Brassica genus of plants have a good reputation for killing off nematodes, and these include tasty plants like cauliflower, broccoli, kale and many other edible crops. Adjusting your harvesting timeline can also have an effect, as can heating up the temperature of the soil with a process called soil solarization. This basically means that you cover the soil around your ginger plants with a plastic sheet, which traps the heat from sunlight inside your soil, killing off the nematodes. You can also use natural manures and molasses mixtures in your soil to help control these pests. Ginger is a primarily a tropical plant, therefore it should come at no surprise that most of the world’s ginger is produced in Central Asia, including countries such as India, Thailand and Vietnam. 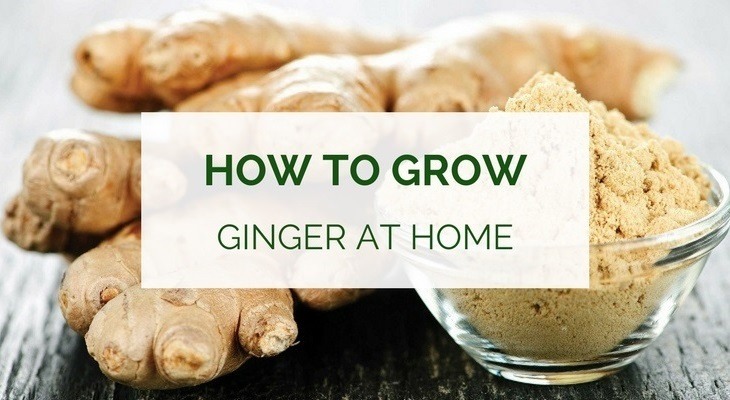 If you are in a colder part of the world, particularly where you may encounter cold dry winters and frost, you may consider trying to grow ginger indoors. If you do live in a colder climate, it may be best to try growing your ginger indoors using an indoor planting setup. Growing ginger indoors means you can have greater control over the temperature and other growing conditions. It is possible to get an indoor growing kit which will assist in regulating the amount of heat, sunlight and humidity required to grow a good harvest. UV growing lights are an inexpensive investment and is one of the best and easiest ways to provide heat and sunlight for indoor plants. Creating a nice humid environment for your ginger is important for good growth. Indoor areas tend to have drier air than outdoors, so growing tropical plants indoors can be a challenge. If you have the space, you can create a DIY Greenhouse area in your home. This may be achieved by using an indoor humidifier which can be easily set up in any room. How to Keep Ginger Fresh? There are many tricks for keeping ginger fresh for longer in your kitchen. One way is to keep the ginger root in the freezer until it is ready to use. This is probably the easiest way to keep ginger fresh for a very long time. Another option is to store your ginger in brandy, which will keep the ginger from rotting without affecting the freshness or taste. You can also pickle ginger in vinegar or sherry which will give it a more sour taste, but makes for some interesting flavor variation. You will often see pink pickled ginger in Japanese cuisine – it makes for a fantastic palate cleanser when eaten between each course, making the flavor of each new dish more distinctive from the last. Another option if you have a good dehydrator is to make ginger powder, which can be used as a spice powder for both smoothies and cooking. If you have excess ginger in your kitchen and you like blending and/or juicing, consider adding it to your home-made green smoothies or juices. Ginger has amazing health benefits and is a versatile ingredient that can be used in many different types of recipes. Ginger is fairly easy to grow at home, and even if you’re living in a colder climate, it can be done. Hopefully this article has given you enough inspiration and information to go try it out for yourself. Even if you’re not a gardener, simply have a go at it and you’ll be surprised how easy it actually is. It gives you a great sense of fulfillment when you harvest your first bunch of fresh ginger that you have planted and grown all by yourself. Very well written article. A complete guide for how to grow and maintain a ginger plant. I’ll definitely follow your tips and try to grow it at home. Thanks so much Aradhana, and good luck with growing ginger at home, it’s fun!